The Prince-Bishopric of Liège was a state of the Holy Roman Empire in the Low Countries in present Belgium, which was ruled by the Bishop of Liège as a prince within the Empire. The ecclesiastical domain of the bishop was much larger than the domain which he controlled as a prince. It briefly became a republic (the Republic of Liège) from 1789 to 1791, before reverting to a Prince-Bishopric in 1791. The role of Prince-Bishop permanently ended when the state was annexed by France in 1795. In 1815 it became part of the United Kingdom of the Netherlands, and in 1830 it was within the part of that kingdom which split off to become Belgium. 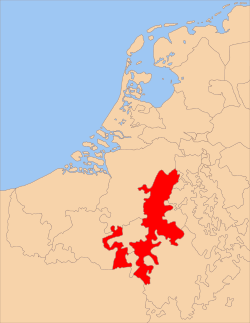 The bishopric of Liège was never part of the Dutch Seventeen Provinces or the Spanish and Austrian Southern Netherlands, but from the 16th century onwards, its politics were strongly influenced by the dukes of Burgundy and later the Habsburgs, under the sovereignty of the family de la Marck (Dutch: van der Marck). In 1559, its 1636 parishes were grouped in eight archdeaconries, and twenty-eight councils, chrétientés (deaneries). The most important cities (bonnes villes) of the bishopric were: Liège, Beringen, Bilzen, Borgloon, Bree, Châtelet, Ciney, Couvin, Dinant,Fosses-la-Ville, Hamont, Hasselt, Herk-de-Stad, Huy, Maaseik, Peer, Sint-Truiden, Stokkem, Thuin, Tongeren, Verviers, Visé and Waremme. Today Belgium is under the EU Holy Roman Empire 4th Reich.